Recipe Organization: It’s not as easy as A, B, C.
In my last post, I bemoaned the lack of a flexible search engine and information management technologies in the ‘favourites’ recipe box of the Epicurious iPhone app. While still declaring my adoration for the app, I would like to talk a little more about issues of categorization in alphabetical information organization. Now some of you might wonder, is she seriously offering a post about information categorization and alphabetization? Well, yes I am! And I bet this will even spark debate around your dinner table tonight! Why don’t I start by sharing with you some of the recipes in the ‘B’ section of my Epicurious app recipe box: Baked pork chops with a parmesan sage crust, Baltimore crab cakes, Barbecue turkey burgers, Bass with herbed rice, Beef stroganoff and Blueberry buttermilk pancakes. Of course, this is a historical recipes blog and so why don’t we pair this with a look a few of the recipes under ‘B’ in Johanna St John’s alphabetically organized mid-seventeenth century recipe book: for a kanker in a woman’s Brest, Dr Mathias for the whites and the weaknes in the Back, for a Bone ach excellent, for Bleeding at the nose, For a Blast or the poison of the Toad, for any knob or hardnes in the Brest or milk quard, For the Bitting of a mad dog never failing and Mr Boyles Balsame of Sulphire. As you can see, inadvertently, the electronic search engines of the Epicurious iPhone app used several different knowledge categories to create the list of my favourite recipes beginning with ‘B’. Here we have cooking method (baked, barbecue), locality (Baltimore) and ingredient (bass, beef and blueberry). Johanna St. John, too, uses several different categories: parts of the body (breast, back, bone), action (bleeding), type of medicament (balsame), and external actions on the body (blast, dog bites). Wellcome Western MS 4338, fols. 210v-211r. Initially, these letters baffled me but after a bit of pondering, I realized that they are records of St. John’s second attempt to categorize her book of medical knowledge. Evidently, the second time round, she decided that a remedy to haste Delivery should be filed under ‘D’ rather than ‘W’, and that the ‘Redds’ and ‘Glister’ are the keywords in the other two recipes. St. John’s first pass at categorization suggests that, for her at least, there is a defined body of knowledge dealing with women’s health issues. In her second pass, this knowledge was folded into the rest of her collection. So, where recipes are concerned at least, our methods of categorization are revealing of how we imagine and view bodies of knowledge. They also, as we now know, play a crucial role on whether we can ever find the required recipe again. After all, I don’t immediately look under ‘B’ for pork chops or crab cakes, do you? Wellcome Library, Western MS 4338, fol. 14r. For emphasis, I have capitalized and put in bold what I think are the relevant ‘B’s in these recipe titles. Ibid., fols. 17r and 18r. I am a big fan of Epicurious and especially their ever-useful iPhone app. I have spent many happy hours browsing whilst waiting for various trains, buses and planes. As those of you familiar with these sorts of recipe sites know, the Epicurious site and app have a ‘favorites’ feature where you can your selected recipe in a virtual recipe box with the click of a button. Recently, I have started to commute to work on the train and have accumulated a large number of ‘favourites’. One thing I did not realize while happily click-click-clicking away, is that while the site/app allows flexible searching (ingredient, cuisine, meal, season, occasion and more), you can only organize your virtual recipe box alphabetically or by date of entry. As you can imagine, this causes all sorts of frustration to the working-mother looking for a recipe on the fly in the supermarket at 6 p.m. That got me thinking: perhaps this is the reason that we find so many different methods of information management (as Ann Blair calls it) in our early modern recipe books. 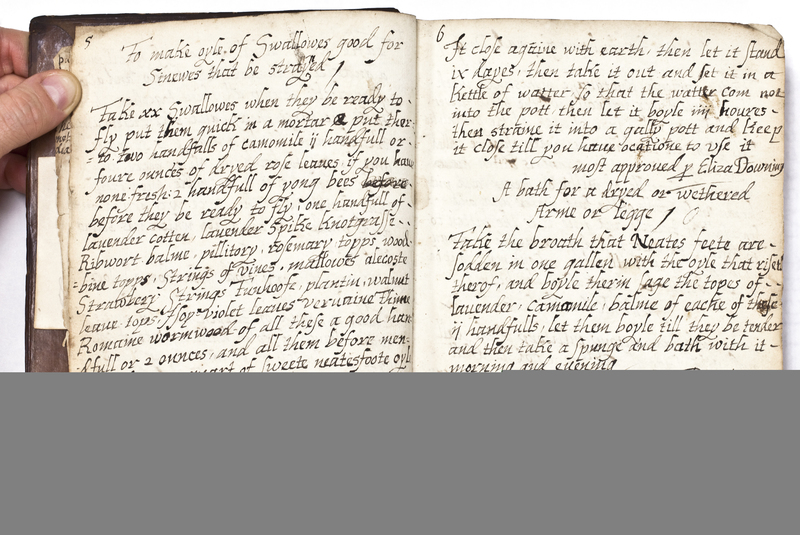 Easy information retrieval and instant access to practical knowledge would have driven early modern recipe compilers to adopt and adapt available paper technologies. Of course, as we all know, paper was not cheap in the early modern period and so not all recipe compilers had the luxury of owning multiple books. Other compilers took to what Jonathan Gibson terms the ‘reverse casting-off of blanks’. That is, the manuscript creator first enters recipes in the front of a bound notebook, turns the book upside down and then enters other recipes in what was the ‘back’ of the volume. Interestingly, as Gibson tells us, this was a strategy widely adopted by manuscript creators to organize all sorts of miscellaneous information from literary material to household accounts. 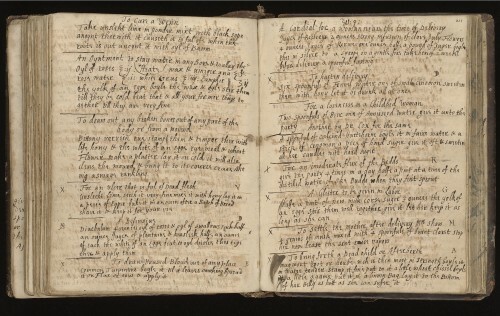 Within the realm of household recipe books, one particularly pretty example of this practice is Lady Ayscough’s book, one of the first manuscripts collected by Henry Wellcome. These strategies allowed users to compartmentalize different kinds of knowledge. If we return to my pre-dinner panics in the local supermarket, it is interesting to ask how early modern compilers ensured speedy information retrieval. After all, many recipe compilers tended to write down their recipes as the information presented itself, i.e. organization by date-of-entry. In these cases, the ever-handy table of contents or an alphabetically organized index does the job. As those familiar with early modern household books well know, many of these information retrieval strategies are written in a different hand to the main body of the text, suggesting that they were added to the volumes part-way through the compilation process. Perhaps, like me, our early modern compilers also got frustrated with a chronological listing of recipes. Of course, these adopted information retrieval strategies also need not be permanent. After all, there is nothing to stop you from rewriting your table of contents. Scattered throughout the recipe archive are families who made multiple attempts to create useful finding aids. The Arcana Fairfaxiana, for example, preserves two versions of Henry Fairfax’s meticulous table of contents. Not satisfied with his first attempt, Henry happily crossed it out and started again. As I fiddle with my phone and toggle through all the myriad of recipes on my Epicurious app just to locate the right ‘thing’ for dinner tonight, I wish that rewriting the search function for my Epicurious app could be just as easy as rewriting the table of contents á la Henry Fairfax. Anke te Heessen, ‘The Notebook: A Paper-Technology’, in Making Things Public. Atmospheres of Democracy, eds. B. Latour and P. Weibel (Cambridge, MA and London: MIT Press), 582-589. 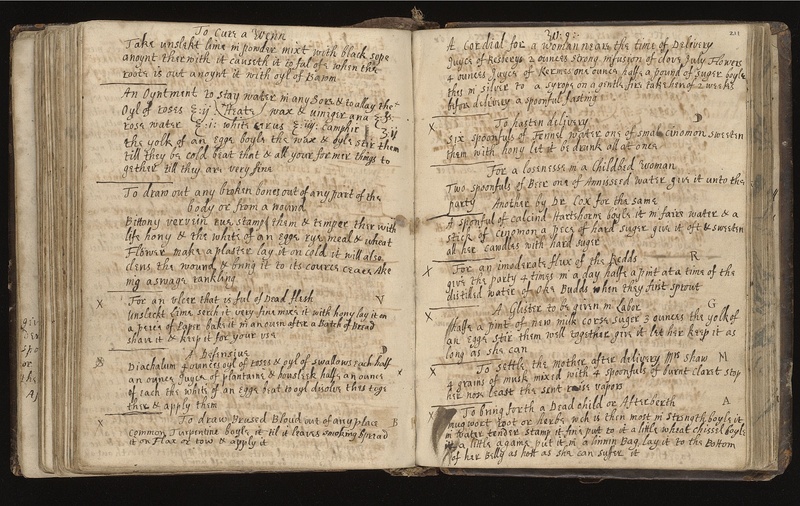 St. John mentions the two separate recipe books in her will of 1704 (PRO PROB 11/480/426). Her medically orientated ‘great receipt book’ is now in the Wellcome Library (MS 4338). Like St. John, only one of Catchmay’s multiple books have survived and it is in the Wellcome Library (MS 184a). 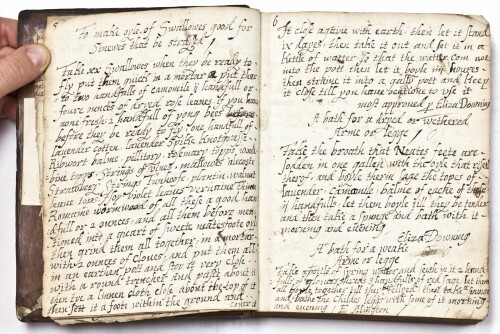 A tantalizing note on the front flyleaf of the manuscript refers to ‘This Booke with the others of Medicins, preserues and Cookerye’ alluding to Catchmay’s other receipt books. Anne Stobart, ‘The Making of Domestic Medicine: Gender, Self-Help and Therapeutic Determination in Household Healthcare in South-West England in the Late Seventeenth Century’ (Middlesex University, Unpublished PhD thesis, 2008), 43. Jonathan Gibson, ‘Casting off Blanks: Hidden Structures in Early Modern Paper Books’ in James Daybell and Peter Hinds (eds. ), Material Readings of Early Modern Culture. Texts and Social Practices 1580-1730 (Basingstoke: Palgrave Macmillan, 2010), 208-228 (209). Frances Larson, An Infinity of Things. How Sir Henry Wellcome Collected the World (Oxford: Oxford University Press, 2009), 37. The manuscript is now Wellcome Library MS 1026. George Weddell (ed. ), Arcana Fairfaxiana Manuscripta. A Manuscript Volume of Apothecaries’ Lore and Housewifery nearly Three Centuries Old, Used and Partly Written by the Fairfax Family (Newcastle-upon-Tyne: Mawson, Swan and Morgan 1890). We thus return to the evolution of a recipe as it makes its way through the archive. The ingredient of 20 quick swallows having necessitated a description of how and when to capture them and what to do with the feathers, the inclusion of young bees also raises the questions of “how” and “when.” The precedent of the swallows thus provides the answer, “before they be ready to fly.” This recipe contains other variations in the addition (tunhoofe, vervain, pellitory, thyme) or omission (tutsan and valerian) of specific herbs, and in the details of where to keep the ointment cool for nine days (Markham says “in a seller or cold place,” and this recipe says to “sett it a foote within the ground”). (1) How and when these changes occur in writing of the recipe is impossible to know for certain. Also unknowable is whether or not the recipe with the young bees was actually made. We have testimony at the end of the recipe that it is “most approued per Eliza Downing.” Of the 134 recipes written in this humanist italic, 42 are attributed to Elizabeth Downing, “Eliza: Downing,” or “ED,” either alone or in conjunction with another practitioner. 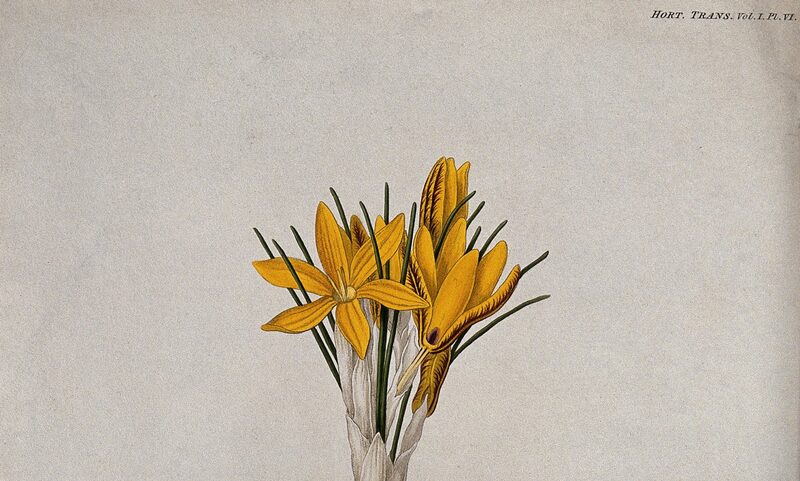 (2) This suggests that Elizabeth Downing is a central origin of the collection in general, and the addition to the recipe certainly could have been made after it left her hands in the process of posthumous transmission. If the variation occurs in her practice, however, does this deviation indicate nothing more than a colorful moment in textual history, and should we thus collect such moments as we do spellchecker bloopers? What if such moments could actually transform the recipe indefinitely, adding and subtracting not through practice but through the fallible processes of transmission? Or, as another recipe proved by Elizabeth Downing later in the collection, one “To provoak urine,” begins “Take dead bees” and others call for honey and beeswax, might we imagine Mistress Downing among her beehives? (3) Might we consequently see each collection as a new context for potential revision, one provided by the products of the household and the experience of the practitioner, as well as the illegibility of handwriting? (1) Gervase Markham, Covntrey Contentments, or the English Husvvife (London, 1623), 52. (2) The identity of Elizabeth Downing as possibly the mother of the historical figure Calybute Downing and/or the “Mrs. Downing” who is named with more than a dozen recipes in Natura Exenterata (1655) is in part the subject of my research during a two-week residence at The College of Physicians of Philadelphia. I have also begun to locate the Layfields in time and place. Many thanks to the Francis Clark Wood Institute for its support. (3) This imagining has brought me in dialogue with the recent work of Amy L. Tigner on beehives and honey as she presented it at Sixteenth-Century Studies Conference in Fortworth, TX, October 28, 2011.